1. 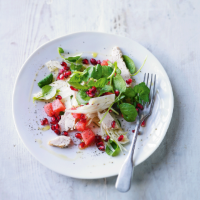 Toss the chicken, fennel, rocket and watermelon. Whisk the lemon juice, oil and seasoning and mix into the salad. 2. Serve sprinkled with pomegranate seeds.